Applegate, the nation’s leading natural and organic meat brand, continues to deliver clean, crave-able food options with the launch of Applegate Naturals® No Sugar Bacon. This humanely raised bacon will satisfy sugar conscious consumers seeking a bacon that doesn’t list sugar as an ingredient, but maintains a hickory smoke flavor bacon lovers yearn for. A recent survey found 65 percent of adults want to cut down or completely avoid sugar in their diet and revealed sugar as the top item consumers are trying to avoid. With half of its products falling under the sugar-free category, Applegate offers a robust selection of meats and cheeses that fulfills the criteria of sugar-free, in addition to the brand’s standards of no antibiotics ever, no artificial ingredients, and no chemical nitrites or nitrates. 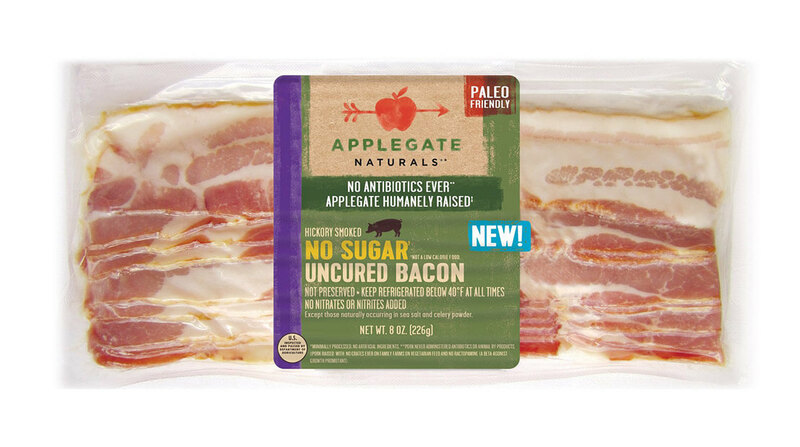 Applegate Naturals® No Sugar Bacon will be available at select retailers, such as Fresh Market and Hy-Vee, August 2017, with a suggested retail price of $5.49 per package. In addition to being sugar-free, Applegate Naturals® No Sugar Bacon is gluten free, casein free, and humanely raised. Hormel Launches Snack Packs with Meat, Cheeses and Nuts Hormel Foods has rolled out a new snack, a meat-cheese-and-sweet item under its Natural Choice meats brand.